Whether exaggerated or not, the true numbers are most likely matched or exceeded by the anti-Israel side which includes IRmep and AET as well as, among others, the rulers of several oil-rich Arab countries. Curious is the assertion that CUFI and IFCJ are “financially inconsequential” compared to the “mainline Israel lobby support organizations.” It’s likely untrue regarding CUFI or its founder and national chairman John Hagee. Meanwhile, IFCJ is not a “lobbying” group. It is mainly, if not exclusively, devoted to assisting impoverished Jews residing in Europe or Israel. A subsequent speaker, Thomas Getman, a Christian theologian, falsely impugned Christian supporters of Israel (more below). But the Gallup organization’s polling contradicts this. Gallup’s polling, during February 1-10 of 2018, shows that Democrat support for Israel (in the conflict with the Palestinians) is essentially the same in 2018 (49 percent) as it was when President Obama took office in 2008 (48 percent). Just 27 percent of Democrats today favor the Palestinians. Just 19 percent of Americans today sympathize more with the Palestinians than with the Israelis. When asked simply whether they viewed Israel favorably (rather than to choose a side in the conflict with the Palestinians), 83 percent of Republicans, 72 percent of independents and 64 percent of Democrats view Israel favorably. The Israel lobby spends a significant amount of resources pressuring the media in trying to shape the narrative, and there are specialty organizations such as the Committee for Accuracy in Middle East Reporting in America [CAMERA] and Facts and Logic About the Middle East [FLAME] and the Israel Project, that do nothing else, but such as watching who comments on C-SPAN every morning and then making a big deal out of it if it’s not particularly happy about [the comments on] U.S.-Middle East policy. The chart shown to the audience includes a screen shot of CAMERA’s homepage teaser for its C-SPAN Watch feature monitoring (“watching the comments on C-SPAN every morning”) the daily Washington Journal call-in show. 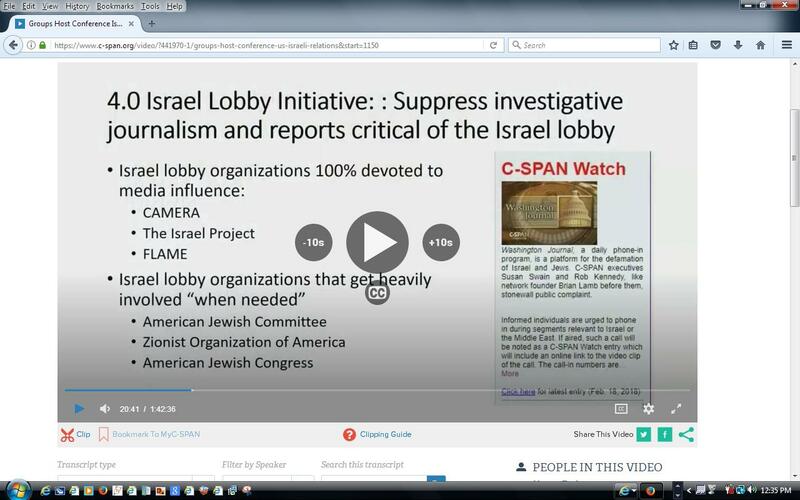 CAMERA’s C-SPAN Watch feature, which provides the only monitoring of Washington Journal available publicly (at least online), shows conclusively that Jews are, and have been over a period of several years, the only ethnic/religious group and Israel the only nation, routinely defamed in broadcasts seen by potentially millions. The public service network, granted special privileges by the U.S. Congress, rarely challenges or even disassociates itself from the inflammatory, mendacious rhetoric. Furthermore, Smith failed to acknowledge that the “C-SPAN every morning” show has included calls from Smith himself (failing to identify himself as IRmep Director), documented in C-SPAN Watch. The voice of Washington Journal caller “Grant from Washington, D.C.” matches the voice of this Grant Smith. His voice was heard when he called in on Jan. 2, 2018 to make the baseless accusation that “the Israelis were in collusion with a [U.S.] plant owner … [and they] stole enough weapon grade uranium to build 10 nuclear weapons.” On Nov. 15, 2017 Smith called in to defame Israel and AIPAC. On May 9, 2016 Smith advocated for “Muslim American” groups in opposition to Israel and vilified “Israel Lobbyists. The passage referred to is Genesis 12:3: “I will bless those who bless you, and whoever curses you I will curse; and all peoples on earth will be blessed through you” (NIV). Contradicting Getman, the biblical contextual interpretation by normative Christianity, as well as Judaism, has always been that the promise is to Abraham and his covenantal descendants, the Jewish people. What Getman is trying to do here is to undermine the unique Jewish claim to the land of Israel by invoking Abraham’s status as the father of three faiths, not just one (Judaism) and then suggest that the two other Abrahamic faiths (Christianity and Islam) have the same claim to the land accorded to the Jews. A problem for Getman is that there are a number of other passages in the Bible which affirm the unique Jewish claim to the land of Israel. After the passing of Abraham, his son Isaac was promised in Genesis 26:24: “I will bless you and will increase the number of your descendants for the sake of my servant Abraham” (NIV). And to Jacob, grandson of Abraham, in Numbers 24:9 is: “… May those who bless you be blessed and those who curse you be cursed” (NIV). Jacob, later given the name Israel, is regarded as the Patriarch of the Israelites. Psalm 115:12 states: “The Lord remembers us and will bless us; He will bless his people Israel” (NIV). There are other promises specifically about the Land, including Genesis 15:18: “On that day the Lord made a covenant with Abram and said, ‘To your descendants I give this land, from the river of Egypt to the great river, the Euphrates.’” (NIV). In Genesis 17:8: “The whole land of Canaan, where you now reside as a foreigner, I will give as an everlasting possession to you and your descendants after you; and I will be their God” (NIV). Over the years, many Christians have concluded that God’s promises to the Jewish people endure even after the founding events of Christianity and that God’s promises to Christians do not abrogate or contradict his promises to the Jewish people. Gerald McDermott, Ph.D, who serves as Anglican Chair of Divinity at Beeson Divinity School of Samford University in Alabama, has written extensively about this issue, concluding that God moves from the particular through the universal and does not abandon the particular as He proceeds. That the “gifts and calling” given to the Jews as described by Paul in Romans 9-11 still abide, McDermott concludes. Relying on McDermott’s work, CAMERA’s Dr. Tricia Miller argues that in-depth analyses of Christian Testament writings shows that “the people and land of Israel are significant concerns in the gospels of Matthew and Luke, the book of Acts, and the epistles of the Apostle Paul. In contrast to what is often believed, Paul’s writings do not eliminate the particularity and irrevocability of the covenant promises made to Israel – promises that include a particular land. To the contrary, as Romans 11:29 declares, ‘…the gifts and the calling of God [to Israel] are irrevocable.’” (“Christian Zionism: The Antidote for the World’s Oldest Hatred,” New English Review, June 2015). CAMERA researcher Dexter Van Zile, writing in The Commentator, has documented Getman’s inflammatory rhetoric. Getman once referred to Hassan Nasrallah, the leader of a violent and antisemitic terrorist organization, as “a friend.” Nasrallah has stated that he someday wants to help destroy all the Jews in the world once they all gather in Israel. Getman called Nasrallah a “friend” years after he left the payroll of World Vision, a Christian child welfare charity, but when Getman worked as policy director for the organization he once submitted written testimony in court over a custody battle between a woman who took her children out of Israel (without her ex-husband’s permission), and the ex-husband who still lived in Israel. In the case, which took place during the Second Intifada, Getman told the court that Israel was an unsafe place for children to grow up. “I believe it would be unwise for Jewish children to return to Israel at this time if they have an alternative option,” he wrote. It was an astonishing propaganda stunt for a World Vision official to engage in. Also, during the Second Intifada, Getman penned a reflection in which he wrote: “It is being suggested by several journalists that a purposed ethnic cleansing is the last gasping effort of a dying Zionist vision in order to sign a death warrant to a parallel viable Palestinian state.” So, here was a person working for a Christian child welfare charity assailing the legitimacy of the one state in the Middle East where children are the safest. CAMERA’s Dexter Van Zile contributed to this section. AIPAC is a lobbying group that advocates pro-Israel policies to the Congress and Executive Branch of the United States. Its stated mission “is to strengthen, protect and promote the U.S.-Israel relationship in ways that enhance the security of Israel and the United States.” It is not an arm of the government of Israel or any Israeli organizations. There is nothing nefarious about this group. AIPAC is bipartisan; it does not get involved in election campaigns. Furthermore, much greater political clout than AIPAC is wielded by, for example, the American Association of Retired Persons, labor unions, the U.S. Chamber of Commerce, the dairy farmers’ lobby or the National Rifle Association (NRA). While AIPAC is frequently vilified by haters of Israel, invariably overlooked is a lobbying heavy-weight, the petro-dollar funded anti-Israel pro-Arab lobby, and direct funding from Arab countries. This influence is felt not only on Capitol Hill, the State Department and Pentagon, through multi-billion dollar weapons purchases but also in academia, with large-scale grants to prominent universities and think tanks, and in society in general through subsidies and material support to mosques, religious schools and advocacy groups. BDS (Boycott, Divestment, Sanctions) started in 2005 as a nonviolent protest about the predicament of the Palestinians. It evolved into demands to halt business with Israeli companies and the government of Israel, and ultimately to destroy the Jewish state. The movement has links to individuals and organizations that have been tied to Hamas, the Palestinian terrorist rulers of Gaza, dedicated to the destruction of Israel. What BDS actually advocates for is the end of Israel. Bogus are the claims that anti-BDS legislation limits free speech. The legislation in various states does not restrict constitutionally-protected free speech or limit criticism of Israel or its policies. What it does is narrowly target commercial activity. The legislation does not create potential criminal or civil liability for BDS actions. Individuals who actively avoid purchasing goods and services because of their own political viewpoint would not be punished. The anti-BDS legislation is typified by the Texas version signed into law. The statute “prohibits all state agencies from contracting with, and certain public funds from investing in, companies that boycott Israel,” The governor stated that “We will not tolerate such actions against an important ally.” Likewise, in compliance with its anti-BDS law, New Jersey recently divested from Denmark’s largest bank for boycotting Israeli companies. Among the other speakers were Andrew Kadi (a.k.a. Andrew Muhab El-Kadi) whose speech was devoted to advocating for BDS and predicting its ultimate success; and Noura Erakat who promoted the false narratives of “occupation” and “apartheid” which have been debunked in numerous CAMERA reports including articles #3089 and #3819.
Who or what is represented by IRmep and AET? AET is thought to have received funding from terrorist sympathizers – jihadists from the Turkish IHH organization instructed supporters to send donations to AET. The IRmep/AET conference’s 13 speakers engaged in a propaganda-fest of anti-Israel rhetoric including advocating tactics which, if successful, would lead to a termination of the Jewish state. The conference’s thrust is untenable. For example, the intellectual and moral bankruptcy of the conference’s case against Christian Zionism is indicated by the fact that the only theologian/scholar presented to make the case, Thomas Getman, is clearly unreliable and his arguments are readily countered. Likewise, the one Israeli among the speakers, Gideon Levy, admittedly at odds with the vast majority of his fellow Jews, irrationally argues, in effect, that this majority is malevolent. Ignored are facts such as that Israel is the only westernized state in a region in which Muslims are killing their co-religionists by the tens of thousands. Another example is Noura Erakat who cannot be taken seriously. Erakat, spouting misleading legalese here, is betrayed by her dossier particularly in the situation in which she equated Israelis to a cancer which needs to be removed. IRmep/AET, supposedly concerned about the entire Middle East, concentrates on disseminating disinformation vilifying Israel and its supporters. Meanwhile C-SPAN, as has been documented by CAMERA, has long been a vehicle for misinformation (at least) about Israel and its supporters. 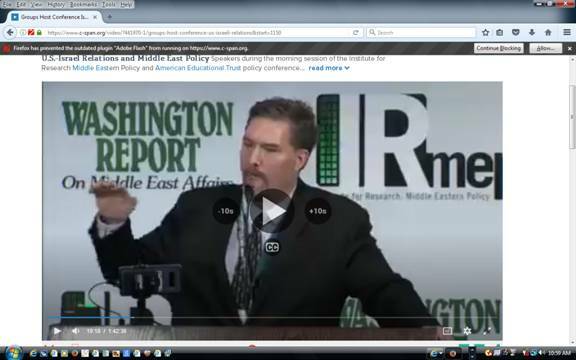 Anti-Israel propaganda events, such as IRmep/AET 2018, are routinely broadcast by C-SPAN without providing context. The network never even bothers to issue a standard broadcast disclaimer such as: “Points of view expressed in this program are not necessarily those of this network.” Here, C-SPAN ostensibly aimed to balance its coverage of IRmep/AET 2018 with that of the AIPAC event (or vice versa). But the balancing act is seen to fall flat when one objectively examines the organizations and their activities.